SUBHEAD: International Atomic Energy Agency has taken over from the World Health Organization as the authority for radiation and health. 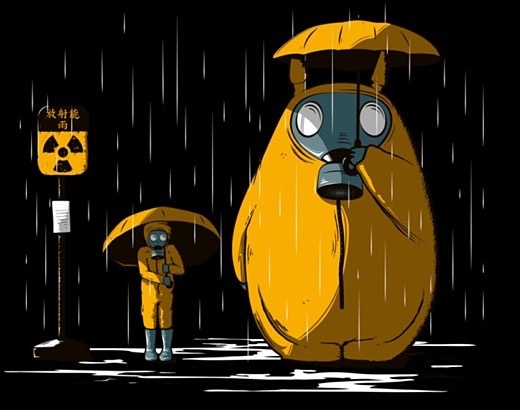 Image above: Illustration of Japanese manga cartoon characters ready for radioactive rain. From (https://www.pinterest.com/krollesque/historique-fukushima/). At one point, Rupert pulled out his Geiger counter and read the dose: 3 microSieverts per hour. “How much radiation would it give in a year to people who came back here,” he asked. Thomas replied: “About an extra milliSievert a year, which is not much considering you get 2mSv a year from natural background”. This recalled the day the first reactor exploded in 2011. I was in London, and the BBC asked me to come into the studio and comment. Also present was a nuclear industry apologist, Dr Ian Fells. Like Geraldine Thomas he seemed unconcerned about the radiation: the main problem for him was that the lifts would not work. People would have to climb stairs, he complained. My vehicle air filter measurements showed clearly that large areas of north east Japan were seriously contaminated – including Tokyo. This was too much for the nuclear industry: I was attacked in the Guardian newspaper by pro-nuclear George Monbiot in an attempt to destroy my credibility. One other attacker was Geraldine Thomas. What she said then was as madly incorrect then as what she is saying now. But the Guardian would not let me respond. The important evidence for me in the recent BBC clip is the measurement of dose given by Rupert’s Geiger counter: 3microSieverts per hour (3Sv/h). Normal background in Japan (I know, I measured it there) is about 0.1Sv/h. So in terms of external radiation, Ruperts’s measurement gave 30 times normal background. Is this a problem for human health? You bet it is. The question no-one asked is what is causing the excess dose? The answer is easy: radioactive contamination, principally of Caesium-137. On the basis of well-known physics relationships we can say that 3Sv/h at 1m above ground represents a surface contamination of about 900,000Bq per square metre of Cs-137. That is, 900,000 disintegrations per second in one square metre of surface: and note that they were standing on a tarmac road which appeared to be clean. And this is 5 years after the explosions. The material is everywhere, and it is in the form of dust particles which can be inhaled; invisible sparkling fairy-dust that kills hang in the air above such measurements. Last month, my German colleagues and I published a scientific paper  in the peer reviewed journal Environmental Health and Toxicology. It uses real-world data from those exposed to the same substances that were released by Fukushima to show that the ICRP model is wrong by 1,000 times or more. This is a game-changing piece of research. But were we asked to appear on the BBC, or anywhere else? No. What do our findings and calculations suggest will have happened in the five years since the explosions and into the future? Let’s take a look at what has happened since 2011. That is a real problem on site with three heavy spent fuel pools still full and largely inaccessible. Collapse of the buildings would lead to coolant loss and a fire or even an explosion releasing huge amounts of radioactivity. So this is one nightmare scenario: Son of Fukushima. A solid wall at the port side may have slowed the water down but diverting the water may cause problems with the ground water pressure on site and thus also threaten subsidence. Space for storing the radioactive water is running out and it seems likely that this will have to be eventually spilled into the Pacific. In an advanced technological country like Japan these will be picked up early by ultrasound and aborted, so we will not actually see them, even if there were data we could trust. What we will see is a fall in the birth rate and an increase in the death rate because we know what has been happening and what will happen; we have seen it before in Chernobyl. And just like Chernobyl, the (Western) authorities are influenced by or take their lead from the nuclear industry: the ICRP and the International Atomic Energy Agency, (IAEA) which since 1959 has taken over from the World Health Organization as the responsible authority for radiation and health (Yes!). • Christopher Busby is an expert on the health effects of ionizing radiation. He qualified in Chemical Physics at the Universities of London and Kent, and worked on the molecular physical chemistry of living cells for the Wellcome Foundation. Professor Busby is the Scientific Secretary of the European Committee on Radiation Risk based in Brussels and has edited many of its publications since its founding in 1998. He has held a number of honorary University positions, including Visiting Professor in the Faculty of Health of the University of Ulster. Busby currently lives in Riga, Latvia. See also: http://www.chrisbusbyexposed.org, http://www.greenaudit.org and http://www.llrc.org.